I learn something every single time I step onto my yoga mat. Sometimes it’s an incredible new lesson. Sometimes it’s simply a gentle reminder. But it never fails and I always step off the mat more inspired and connected than when I started. I’ll be guest blogging each month to share my latest lesson from the mat with Kristin’s community. Recently I rolled out my mat with every intention of a long, non-stop flow session. I hadn’t worked out in a few days and decided that I needed to get my heart rate up and sweat. I was ready. And then I did my first sun salutation and felt exhausted. My body was screaming for me to stop pushing but my mind was telling me to keep going. I needed to work out and was determined to push through. So I did another round and another…until I felt the uncontrollable urge to stop. I was in child’s pose and couldn’t move. Every cell in my body was keeping me in this position. I gave in – the yoga video kept playing and I just stayed in child’s pose – for 45 minutes. And it was exactly what I needed. So often we silence the voice of our bodies by pushing too hard, not getting enough sleep, eating foods that don’t serve us, and ignoring self-care. We view stress as a badge of courage and ignore illness or discomfort. We suppress our feelings and go, go, go to the point of exhaustion. All the while our bodies are whispering to us – trying to guide us. Eventually those whispers become screams. Maybe the scream is in the form of an illness you just can’t shake, a migraine, pain, pulling a muscle, or complete and total exhaustion. We hit our limit and have no choice but to listen. Our bodies are so much smarter than we are. They are designed to find balance and health. And they are really good at pointing out when something isn’t quite right. We just need to take the time to notice. Keep a food journal – one of the greatest ways to turn up the volume on what your body is saying is to keep a food journal for a week or two. This isn’t the calorie/fat kind of journal, though! Keep careful track of what you eat and drink each day, at what time, and how you feel emotionally and physically after each meal. At the end of the week, review your journal. What foods made you feel energized, satisfied, and strong? What foods left you lethargic, bloated, or craving more? Your body is communicating with you. The foods that fuel you will make you feel great. The foods that don’t serve you will make you feel sick, tired, or leave you craving junk. Sleep when you’re tired – sleep. It has become a bad word. We all want and need more sleep. So why aren’t we sleeping?! Sleep is one of the most important things that your body needs to be healthy and strong. And it’s an area where we have gotten really good at ignoring what we need. We power through on coffee, snacks, and sugar. We tell ourselves that we only need 3 or 4 hours of sleep. That we’ll “catch up” on our sleep over the weekend. But that 3pm yawn-fest is your body trying to get your attention. You know that point in the night when you’re on the couch and think, “I could go to bed right now” even though you still have stuff to do? Do it. Go directly to bed. Don’t force yourself to stay awake. Your body will regulate and establish your sleeping routine, if only given the chance. You’ll discover how much sleep your body needs and will start waking up in the morning actually feeling rested! Close your eyes and breathe deeply in and out through your nose. Notice where you are carrying tension in your body. Place your hands on that spot and breathe deeply imagining a warm, golden light pouring into the tension. Breathe out and imagine the tension being washed out of your body. 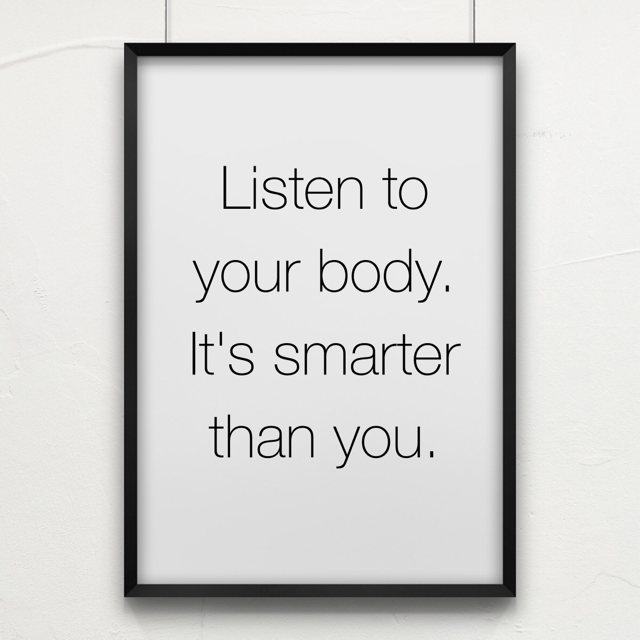 What is your body trying to tell you? How can you pay more attention?